The modern everyday is unimaginable without the digital media – commercials, shows, movies, and music videos widely fill the gap of time and entertain the wider public. In the transition through the mediums, the emotion can get lost within the mass of content, and individual characters portrayed are often much alike one another in this regard. 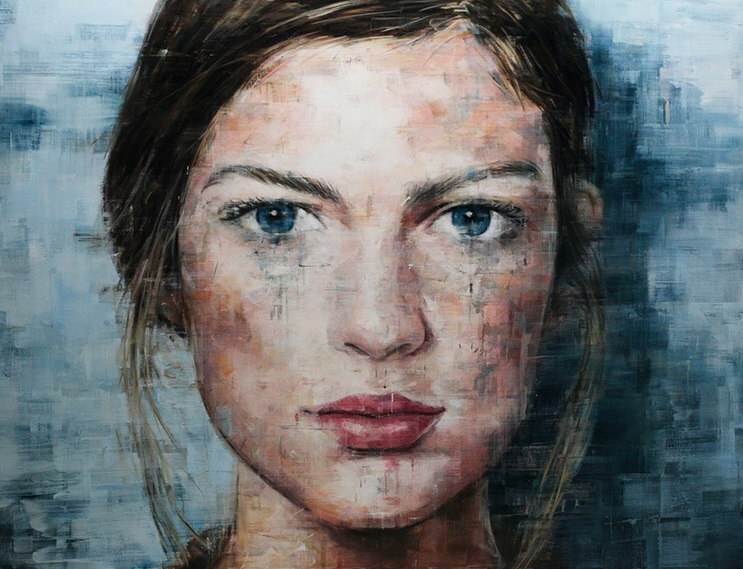 Pulling them out of the TV and computer screens, the German contemporary artist Harding Meyer paints the well-known faces and instills a certain depth of humanity and feelings that are hardly transmitted as such in their digital counterparts. With a practice focused on portraiture, Meyer shows us a whole new side to the all-too-familiar faces. Harding Meyer’s focus is rather straightforward in narrative – depicting faces seen in TV shows, movies, magazines and catalogs, Meyer pulls them out of their original surroundings and gives back the characters their individuality. Leaving their background and on-screen purpose out of the equation, he decontextualizes the original “image” of the people depicted, portraying a different personality than the one seen on the screen. 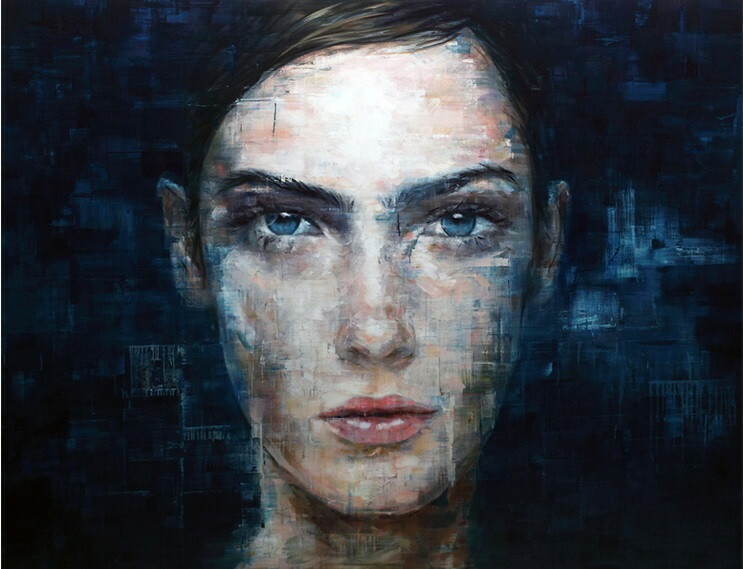 By placing the face in such a close relation to the viewer, he makes each of his pieces very personal and they do not disappoint when it comes to emotion. 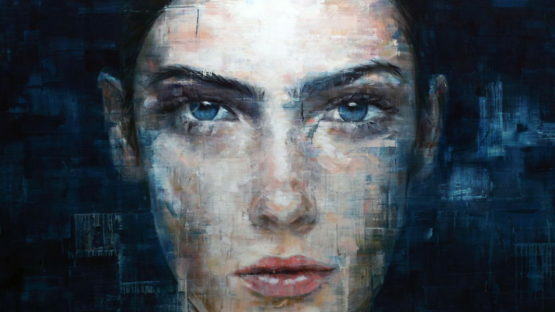 They say that the eyes are the doors to the soul, and Meyer’s oil paintings truly give meaning to these words. Oddly enough, most of his portraits are placed upon slightly horizontally aligned canvases contrary to the generally accepted norm of vertical alignment. Through this detail, Meyer keeps the connection between the original medium of the screen and it isn’t the only bond. 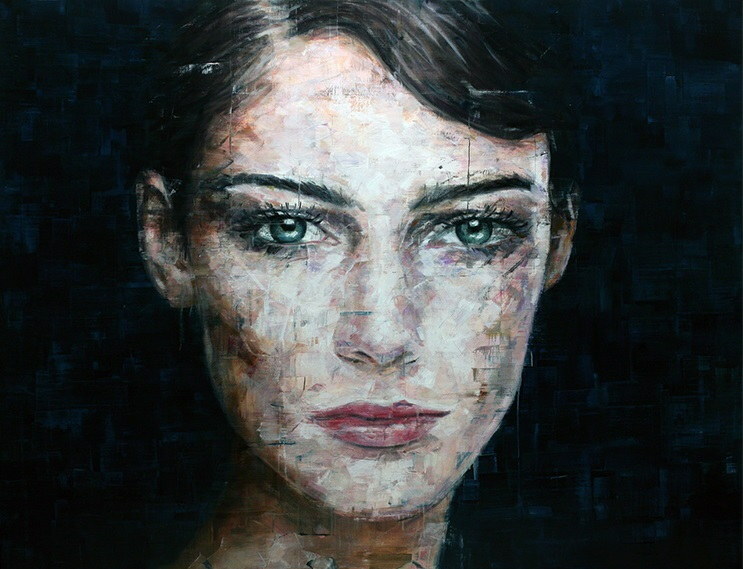 Treating the many layers of paint with a palette knife, his portraits, smudged and blurred at certain points, remind a lot of pixels constituting a computer image or the horizontal lines often seen on the TV screen. In a process that may take up to six months, Meyer has managed to merge portraiture and the landscape format, instilling his pieces with an eerie feeling that binds the viewer. Although you may have seen the people in his paintings before, Harding Meyer throws a completely different light on the characters he chooses to depict. With his practice formed around the figures seen in the widespread media, the artist captures the essence of personality and portrays it through the faces stripped of their former roles, titles, and names. Picking his subjects out of the endless pool of the screen, Meyer seems to bring some of the medium’s technical characteristics over to the canvas as well, creating an unconventionally oriented “landscape portraits” that are bound to hold the attention and connect with any viewer. Harding Meyer lives and works in Berlin and Karlsruhe. Featured image: Harding Meyer – Untitled (23-2014) (detail), 2014. All images credit Harding Meyer. All photos used for illustrative purposes only.